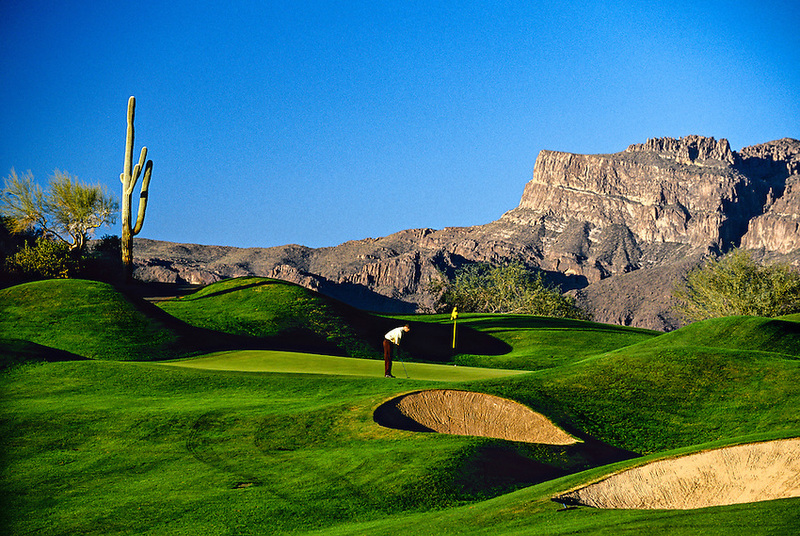 Dinosaur Mountain is ready to offer you a truly unique golfing experience in the high Sonoran desert. Every tee box presents a panoramic vista and an exhilarating challenge to your game. The course will take you up, over and around Dinosaur Mountain with dramatic tee-to-green elevation changes and long, loping fairways. The views of the nearby Superstition Mountains are spectacular. Signature holes #3, #4 and #5 are among the most memorable in the game! It doesn’t get any better than this! Choose from two championship courses, Dinosaur Mountain rated 4 1/2 stars or the Sidewinder rated 4 stars by Golf Digest. The Dinosaur Mountain course has been rated in the Top Ten's most "Under-rated" golf course in the country by Sports Illustrated. 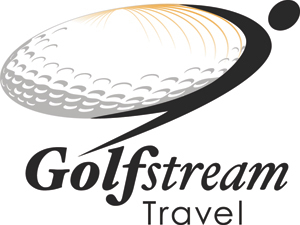 Perfect for one or two couples to share or 4 guys playing golf. Amenities include Hiking, Swimming Pool, Jeep Tours, Massage and Spa Services and much more! Enjoy spectacular views while Dining at Kokopelli's Restaurant, The Bar & Grill or The Ledge at Dinosaur Mountain. Over 10,000 feet of Distinct Full Service Meeting and Banquet facilities for functions ranging from 10-200.Located just 35 minutes from Phoenix Sky Harbor International Airport, this very special mountainside resort is close enough to the Valley of the Sun, yet far enough away to let you experience the peace and unmatched beauty of the high Sonoran Desert enjoy a true Arizona Golf Resort experience Sonoran Desert. Come. Featuring 85 rooms and offering a full slate of amenities and activities, the Gold Canyon Golf Resort truly lives up to its motto as an Extraordinary Escape from the Ordinary. Just 30 miles from Downtown Phoenix, Gold Canyon offers spectacular views of the majestic Superstition Mountains, which guests can enjoy from their private patios. Relax at the indoor or outdoor spa, where relaxation and rejuvenation is par for the course. For those who get their relaxation on the golf course, Gold Canyon offers two unique golfing challenges. Dinosaur Mountain - rated 4.5 stars by Golf Digest - gives golfers sweeping elevation changes that will dazzle the eye while challenging their game. 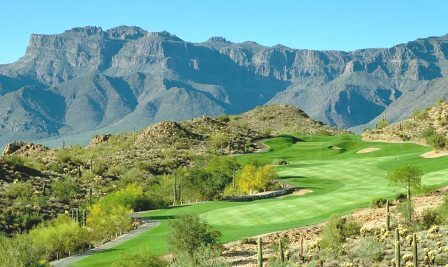 At Sidewinder, the Sonoran Desert is on full display as the golf course wends its way through the land's natural arroyos and dry creek beds making it the perfect desert golf option. 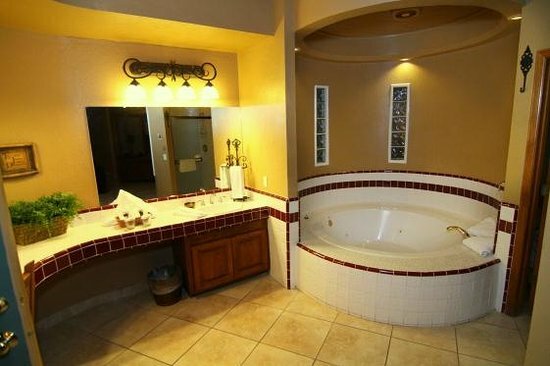 Other amenities include hiking, biking, Swimming, massage and numerous spa services. Dining options include Kokopelli's Restaurant, The Bar & Grill or The Ledge at Dinosaur Mountain. 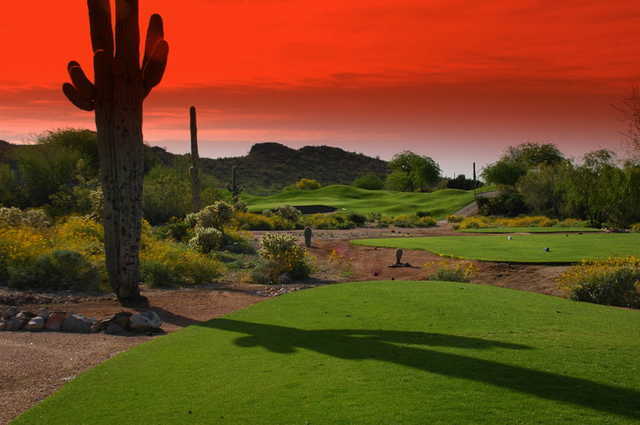 All told, this mountainside resort gives its guests the peace and unmatched beauty of the high Sonoran Desert while spoiling them with the luxury they demand from an Arizona golf resort.